Use any power in struggles wisely during this lunar month. If someone comes at you with their anger and other harsh energies, allow their stuff to pass on by, without entering your body and emotions. A good time to: Go in like a fire storm, get it done, get out. Challenges: Difficulty recognizing the degree of a challenge before you. It may seem easy but it could be hard. Or the opposite. Balance: Ask for help when you need it. 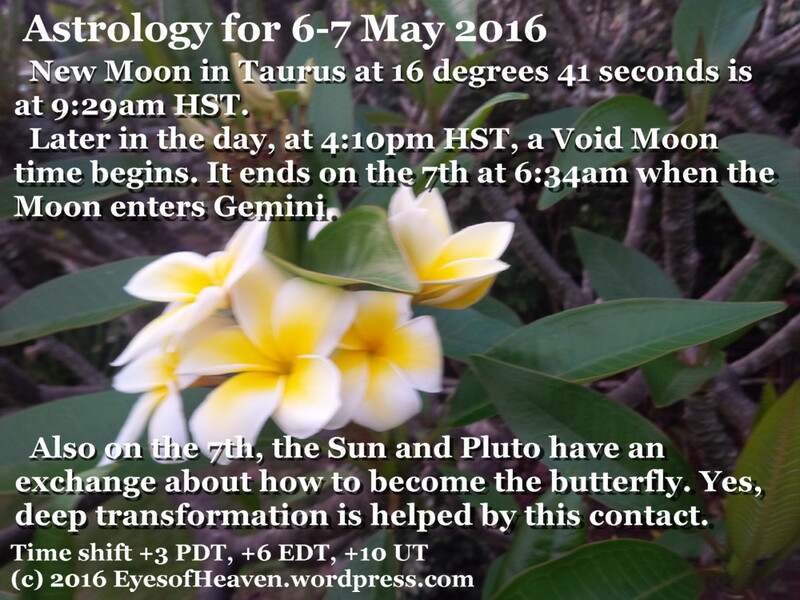 The New Moon in Taurus occurring on Friday, May 6th, 2016, at 3:29 PM EDT is our ticket to paradise! New Moons are about release, renewal, and fresh energy and in Taurus, heightens our awareness of natural beauty, while bringing us closer to all things decadent, soft and lovely. “Lucky Jupiter turns direct in the heavens during this initiating New Moon phase on May 9th 2016 and the two benefics, Venus and Jupiter, come together the following day, May 10th 2016. This New Moon really is building towards something special. The New Moon on May 5th is 16 degrees of Taurus conjunct Mercury Retrograde, directly following Beltane, an ancient pagan holiday with Celtic origins which celebrates the union of the Green Man and Green Lady of the woods and of the wilds of nature. A Grand Earth trine to Jupiter and the North Node in Virgo and Pluto in Capricorn indicate that although the ground beneath us might feel shaky and we might fear that we are falling into it, the soil is rich and churning, with deep layers ready to reveal new sparkling facets of themselves to the surface. The Moon is in Taurus all day, and a New Moon occurs later this afternoon. This is a great day to be around the folks that make you feel safe and secure. Take some time to literally smell the roses today, because this energy is all about pleasing ones senses. Do the kind of things that entice you and that can bring you pleasure, like eating a good meal, soaking in a nice bubble bath, listening to music, or just enjoying a good emotional conversation with a friend. Don’t forget while attending to your own needs you should also be writing out the “Intentions” you would like to set today with this glorious New Moon! The new moon this evening occurs at 16° Taurus. New moons are a time to plant seeds that will grow into the full moon and pass my the next new moon. These cycles are said to be a time when the light of consciousness (sun) shines over the dark of our subconscious (moon), so we are more primal and less aware at this time. It’s important to channel your intentions in a way that is constructive, rather than excessively or destructively compulsive. New moons are also good times for gauging what is working and what isn’t from the last moon cycle. With the new moon in Taurus the focus is on creating and relishing in your personal value, developing the senses, and finding solidity within yourself. Clear the decks. Make the space. 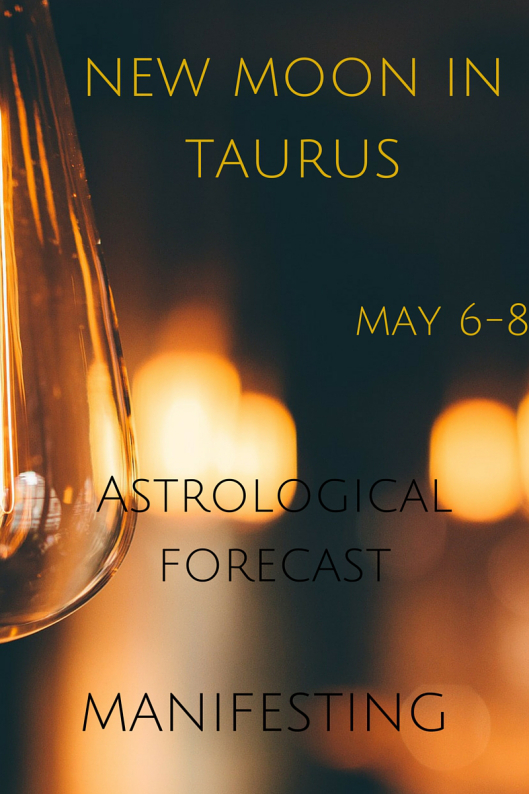 Open your mind to the New Moon in Taurus and the possibilities this May moon brings with it. It is not all wine and roses (still in some serious retrogrades) but it is not all piss and vinegar either. 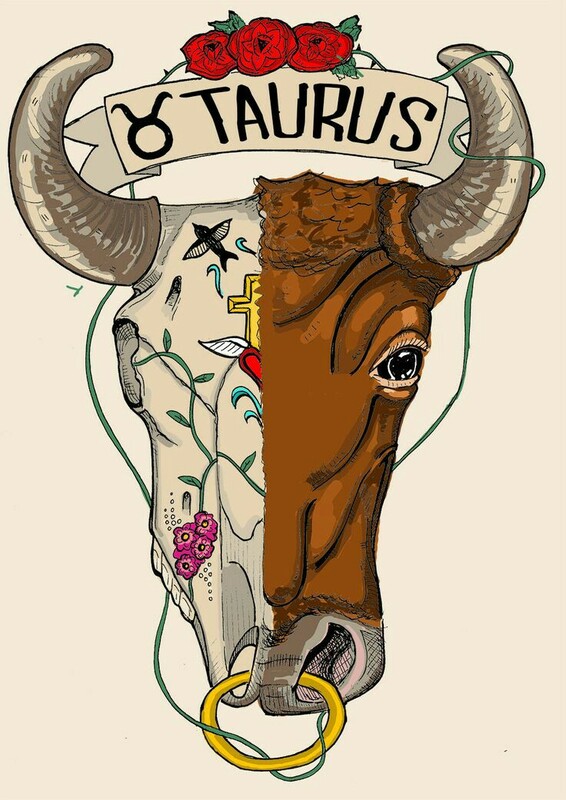 Taurus is about grounding in the sensual nature of life and manifesting the magnificence within and without. It’s time to bury the past and face the future head-on. Looking backward has been productive but this is the moment (or the moments) when we need to separate the wheat from the chaff. In other words, keep what has worked and let the rest of it go. We’re under the gaze of an intense New Moon in Taurus (integrating Earth) today. Settle into yourself and launch what needs launching already. BTW CHECK THE (RX) RETROGRADING PLANETS. There are 5. Whatever you held onto in secret for the past several years, now is the time where it all comes out. Get out of the closet because it’s burning down, bbs. And very practically in a luxurious full-feeling kinda way. Will your dance be tragic or revolutionary? This is an extremely practical transit with the focus being on empowered and creative touch, tactile, sensation, luxury, what you are more than who you are. All the Taurus and Sag plus Jupiter in Virgo lead me to this, plus just the experience from literally EVERYONE around me. As the current Mercury Retrograde in earthy Taurus allows us to direct our mental faculties inwardly, and the Taurus New Moon allows both inner and outer modes of consciousness, rational and instinct, head and heart, to align for a moment, we can ask ourselves why it is that mental vulnerability is so on the increase. When I left university in the eighties, depression was known to affect some in society around the age of 30, but currently researchers say first onset can occur at age 15. Duke University researcher Stephen Izard describes how the rate of depression in the West seems to be doubling every generation. This implies that basically every second person of 18-29 years old will be depressive by mid life, and what’s more, in the next generation after that, everyone will be depressed.